The picture of Scarlet Witch amid some blue-pencilled characters that appeared in WIZARD is not from JLA/AVENGERS. A couple of years ago WIZARD had asked me to lay out a proposed poster for their 100th issue. The piece would be a montage of 100 characters to be pencilled and inked by various artists but the whole thing was designed in blue pencil by me. That's why each of the characters, from various companies and creators, were numbered, so that the other artists could refer to a key and draw their character where indicated. That particular artwork was never completed, presumably because of the inability to coordinate it with the schedules and availability of many of the artists WIZARD wanted involved. When WIZARD asked me for samples of my blue-pencil method, the only thing I had were JLA/AVENGERS pages which I couldn't let them have. They obviously still have my original poster layout with Wanda being one of the characters that I pencilled and inked myself. 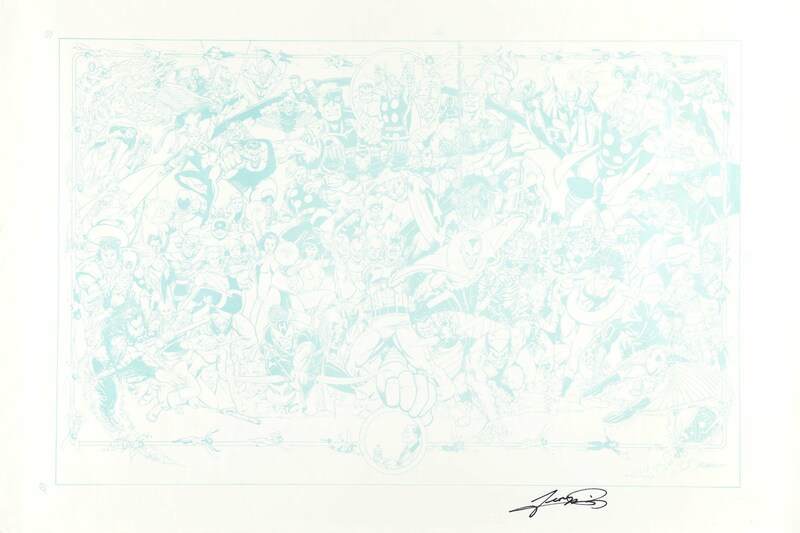 "As I started to do more detail-oriented work, I realized, 'This is getting confusing,"' laughs artist George Pérez. "By doing the basic construction with blue pencils, I didn't have to worry about the inker inking a construction line across a character's head." Today, Pérez finds non-repro pencils to be an invaluable tool - even when inking his own work. "With JLA/Avengers, I still use the blue pencil. Not only to indicate where the characters are going to be and minimize the number of erasures, but also for perspective grids when I'm doing the background."